The Ariane 5 for Flight VA216 begins its rollout to the Spaceport’s ELA-3 launch zone, illuminated by the Final Assembly Building during the pre-sunrise transfer in French Guiana. 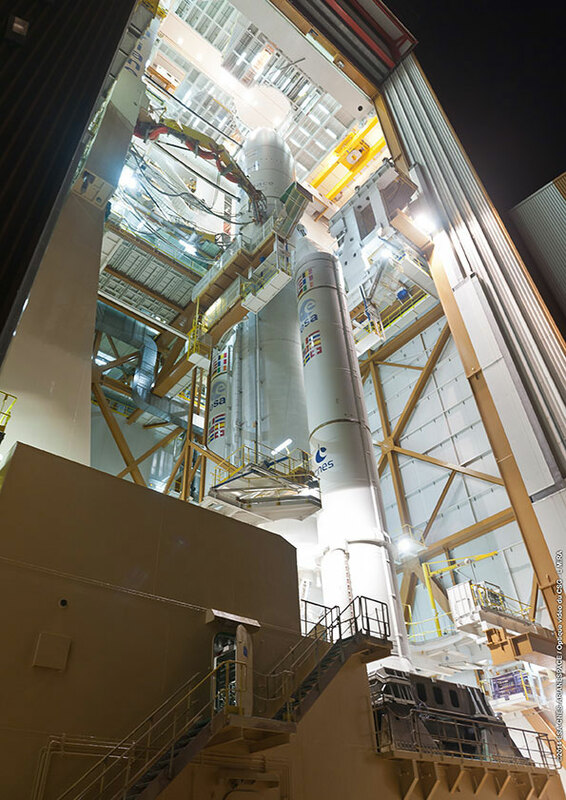 Arianespace has delivered another Ariane 5 to the launch zone at Europe’s Spaceport, positioning this workhorse vehicle for liftoff tomorrow with a pair of telecommunications satellites: ASTRA 5B and Amazonas 4A. 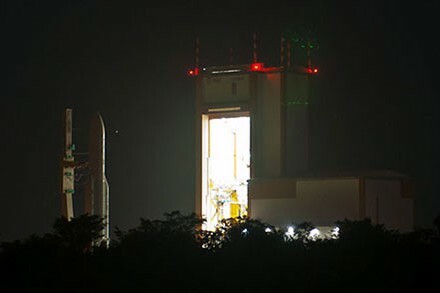 The vehicle rolled out before sunrise this morning from the Spaceport’s Final Assembly Building for Ariane 5 to the ELA-3 launch zone, where it is scheduled for liftoff during a 58-minute launch window that opens March 22 at 7:04 p.m. local time in French Guiana. Installed on its mobile launch table, the Flight VA216 launcher is ready to roll out from the Spaceport’s Ariane 5 Final Assembly Building for its early morning transfer to the ELA-3 launch zone. For the 73rd overall flight of an Ariane 5, the payload lift performance is more than 9,575 kg. – which includes a combined total of some 8,755 kg. for the two payloads – to be orbited for customers SES and Hispasat – plus the launcher’s dual-passenger dispenser system and satellite integration hardware. ASTRA 5B is based on Airbus Defence and Space’s Eurostar E3000 platform. After its deployment by Ariane 5, it will extend operator SES’ transponder capacity and geographical reach over Eastern Europe and neighboring markets, delivering direct-to-home, direct-to-cable and contribution feeds to digital terrestrial television networks. The spacecraft also carries a hosted L-band payload for the European Commission’s European Geostationary Navigation Overlay Service (EGNOS). Amazonas 4A was built by Orbital Sciences Corporation, and it will provide enhanced relay capacity over Latin America and an extended range of communications and television services for operator HISPASAT from a 61 deg. West orbital slot.